Tanzania, the largest country in East Africa, lies just south of equator, between the Indian Ocean and the great lakes of Victoria, Tanganyika and Malawi. Our company practice in the country since 1993 during the hunting season which occurs from July to December and we are directly allocated the hunting blocks on where we hunt. Situated in Rungwa Game Reserve on the edge of Ruaha National Park, the area is a mixture of miombo woodland with little rocky hills and open plains. It covers about two million acres, an altitude of nearly 1100 meters which allows a temperate climate. Nights and early morning could be cold. Rungwa/Kisigo Game Reserve supports large numbers of wildlife such as buffalo, zebra, eland, impala, East African greater kudu, roan antelope, sable antelope, klipspringer, reedbuck, bushbuck, Lichtenstein's hartebeest, warthog, bushpig, oribi, grysbok, common duiker and other species. Some rivers support hippopotamus and crocodile and of course there are plenty lion and leopard. 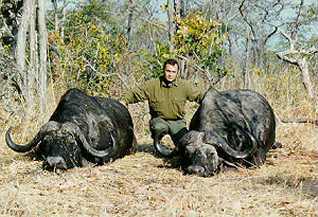 It is very wellknowed for the variety of species and quality of trophies, especially lion, buffalo and big antelopes. It is possible to hunt from 1st of July until 15th of November from when rainy season starts. Close to Tarangire National Park in Northern Tanzania, at an altitude of 1100 meters, the landscapes are various with open grassland (the masai steppe), acacia savanna but also little mountains and thick bush. The main species are Grant's gazelle, impala, steinbuck, lesser kudu, gerenuk, fringe-eared oryx, zebra, wildebeest, ostrich and leopard. Lions and buffalos are present but live in thick bush and are more difficult to hunt. Other species are Coke's hartebeest, eland, greater kudu, dik dik, warthog, bushpig. Bohor reedbuck and serval cat can be found. Thomson's gazelle is very scarce. Hunting from 1st of July until 31st December though short rains can appear from mid-October. This area is located along the Luwego river in the southwest part of the well known Selous Game Reserve. Landscape is a classic miombo woodland with some few gallery forest. The species to be found amoung others are impala, common waterbuck, Nyasaland wildebeest, zebra, greater kudu, buffalo, Lichtenstein's hartebeest, sable antelope, lion, leopard, common duiker, spotted hyena, hippopotamus and crocodile. Elephants could be possible, but Tanzanian regulations are very strict: each tusk must weigh a minimum of 20 kgs. or have a length of 1,70 meter. We hunt in Selous from 1st of July until mid November. Hunting clients and their guests are accommodated in classic safari camps equipped with flush toilets, hot showers, fridges and deep freezers. Electricity works, on solar which, at night, avoids the noise of a generator. Meals are served with the finest available vegetable and condiments. Accommodations include daily laundry service and a staff to meet every need. Communications are provided by radio permanently with our office in Dar es Salaam. Satellite phone is available by prior arrangement. A maximum of three hunting rifles may be imported into Tanzania. The minimum caliber for dangerous game is .375 Mag. and a maximum of 200 rounds of ammunition per firearm is permitted. Our professional hunters have a great experience and are members of the French Association des Chasseurs Professionnels (ACP). All of them are fully licenced in Tanzania and speak English fluently. 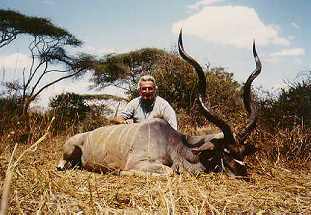 Jean BEGUERIE, age 44, hunts with us in Tanzania since 1993. 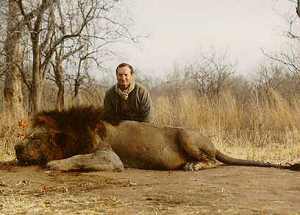 He has hunted before in Cameroon (1992), Burkina Faso (1990 and 1991), Texas, at Indiana Ranch (1989) and Senegal (1988). He speaks also Spanish and is a SCI measurer. Florent MATHIEU, age 34, started also in C.A.R. in 1989, then went to Cameroon (Savanna and Forest) from 1992 till 1998. He is hunting with our company since 1996 and is working also in C.A.R. Romain PILON, age 31, is hunting with us in Tanzania since 1995. Penn de VRIES, age 38 comes from Zimbabwe. 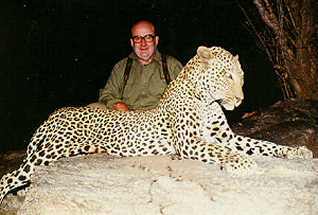 He has obtained his Professional Hunter's licence in this country in 1988 and has a great experience in hunting dangerous animals. In year 2000, he obtained the trophy award for the best elephant shot in Zimbabwe. A valid passport and visa are necessary for entry into Tanzania. Visas are issued by your nearest Tanzanian Embassy or Consulate. To obtain import/export of guns and hunting permits, following information will be needed: calibre, make, model and serial number of rifles, calibre and amount of ammunitions to be imported, full passport details and 4 passport-type photos. You are not covered by any insurance and you are advised that you and your property should be fully covered, using your own arrangements for the duration of the safari, including trip cancellation, loss of personal effects, medical including emergency evacuation, accidental death and disability. A hunting liability insurance is compulsory and if needed, we can provide it from our agent in Paris for an amount of 180$. Valid certificate for Yellow Fever is no longer necessary to enter Tanzania. Malaria is endemic and suitable precautions should be taken. It is also advisable to bring your own prescriptions and a small medical case. To fly on KLM and Swiss obliges to spend a night in Dar es Salaam before the beginning of the safari. There are good hotels in Dar and we recommend Royal Palm (central), Seacliff, Hollyday Inn or, for a lower cost, Jangwani Seabreeze at 15 kms from the town, on the ocean. 2 x 1 - There will be two cats, as such one client will hunt a leopard and the other client will hunt a lion. 2 x 2 - Each client will hunt one lion and one leopard. 3 x 2 - There will be two lions and two leopards. It will be upon the clients to agree among themselves as to who will hunt which cat. 4 x 2 - There will be two lions and two leopards. Clients will have to agree among themselves as to who will hunt which cat. 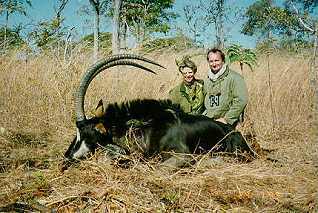 You are allowed to hunt also impala, hartebeest, bushbuck, reedbuck , duiker, steinbuck, oribi, dik-dik, warthog, bushpig, jackal and hyaena. Any additional vehicle, i.e. bating car, photographic car, etc. A complete list of hunters with their results is available as references.